Migration of only a table structure - creating a blank table in the receiver data base. Migration of data only - copying the data from one table to another existing table. Migration of both structure and data - creating a new table in the target database having same structure and containing same data as the source table. Tables, views and virtual tables can be used as source object when migratin structures. Tables, views, virtual tables and stored queries can be used as source data objects for migration data into a target table . With the migration of the structure, the program automatically converts (if necessary) the column parameters according to Convert Options settings. 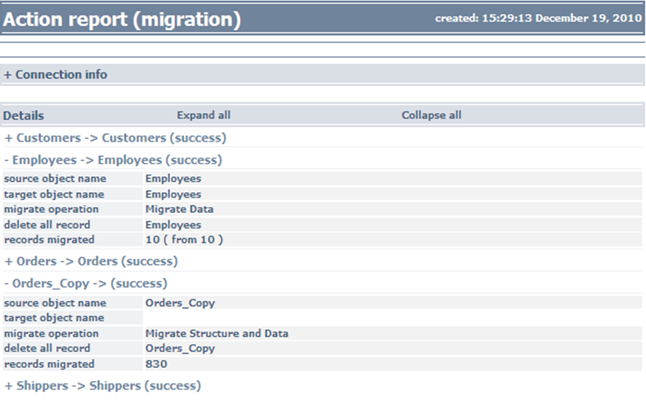 Select and map the objects intended for migration in the Batch Migration dialog. NOTE:The program maps the objects of the selected groups automatically, on the object names basis. However, the user can manually redefine any object pair for further synchronization. The program automatically assigns the mode of the migration operation, based on the presence/absence of the table in the destination database. However, the user is able to change the assigned mode. In order to create a report on the migration procedure – check the Report Filet box and set the parameters for the report file. Figure 36: Request for the migration report. The program will execute the requested procedure and it will compose a results report (if the appropriate option has been selected)..